Zotac introduces two new GeForce GTX 680 graphics cards; the GTX 680 AMP! with a custom dual-fan cooler, 1110MHz base, 1176MHz boost, and 2GB GDDR5 clocked at 6608MHz, and a GeForce GTX 680 with standard clockspeeds but 4GB GDDR5. ZOTAC International, a global innovator and channel manufacturer of graphics cards, mainboards and mini-PCs, today unveils the amplified ZOTAC GeForce GTX 680 AMP! Edition and high-resolution dominating ZOTAC GeForce GTX 680 4GB graphics cards for the most demanding gamers and enthusiasts. Catered to gamers that require that extra performance kick in the most demanding gaming situations, the ZOTAC GeForce GTX 680 AMP! Edition harnesses the untapped power of the NVIDIA GeForce GTX 680 graphics processor to maximize frame rates in the latest visually stunning Microsoft DirectX 11-enabled games. 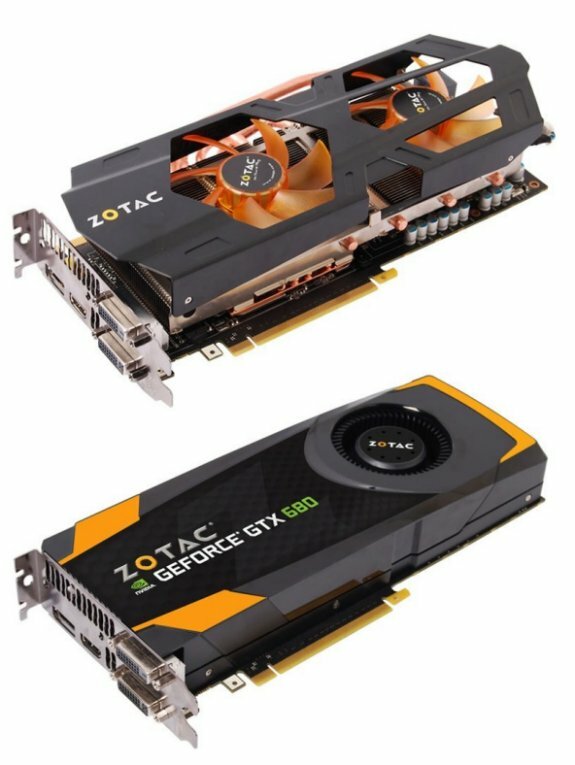 Extreme high-definition and triple-display gamers can opt for the ZOTAC GeForce GTX 680 4GB which doubles the amount of video memory for that extra bit of smoothness at resolutions above 2560x1600, including 4K and 3840x1080. Quad-display output capabilities enables the ZOTAC GeForce GTX 680 AMP! Edition and GeForce GTX 680 4GB to simultaneously power four independent displays in desktop mode at resolutions beyond 2560x1600, including new and upcoming 4K resolution displays. NVIDIA 3D Vision™ Surround technology joins three 2D or 3D displays together to render a massive wide display for superior immersion and enhanced field of view when gaming with the ZOTAC GeForce GTX 680 AMP! Edition and GeForce GTX 680 4GB. The ZOTAC Assassin’s Creed 3-Game Pack is bundled with the two cards to let gamers take advantage of the newfound graphics power right out of the box. Assassin’s Creed I, II and Revelations takes gamers through an epic historical journey with beautiful graphics, captivating storylines and immersive gameplay. It’s time to play with the ZOTAC GeForce GTX 680 AMP! Edition and GeForce GTX 680 4GB!